It was my birthday in May, so my partner, Anthony and I decided to go on an overseas trip to celebrate. We love South-East Asia and all that the region has to offer as a holiday destination, especially being so close to us as Australians! We had heard so many amazing things about Vietnam from our friends, and we had both never been. As we have limited time and this is our first trip to Vietnam, we thought this was an excellent opportunity for us to book a local Vietnamese tour guide to show us around rather than explore it ourselves. The best way to explore the local life is to go with a local Vietnamese tour guide. To truly experience a city, you need to travel like a local and see it through the eyes of a local. 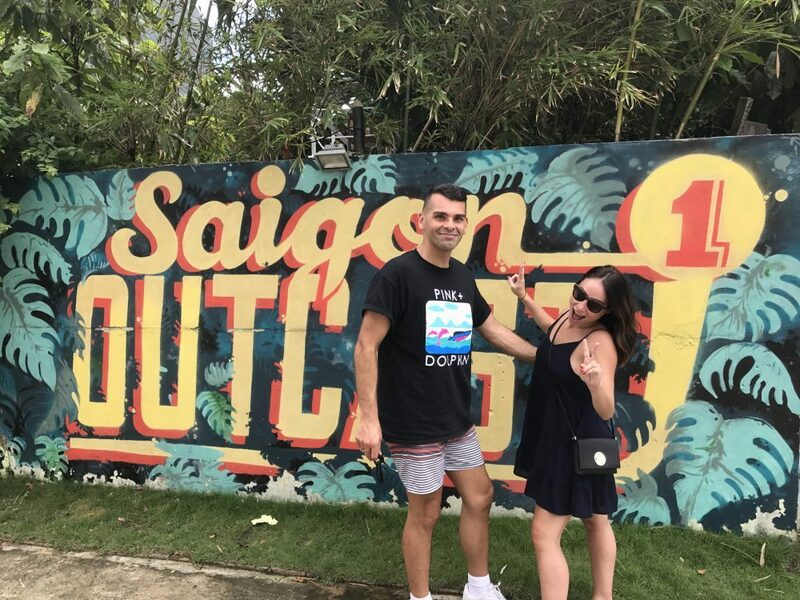 In Vietnam, we came across Inspitrip through a web search, when we were looking for a guide and we loved that they use real people who just want to show you the real Saigon experience in a fun way. We don’t like the touristy style trips that take you to the well-known landmarks in big groups, we wanted to be taken off the beaten track and live like locals for the time we were there. We expected to have a fun city experience, full of great food, great people and a busy nightlife. What we discovered was so much more, so much history and lots of hidden treasures. The first local insider we booked was Alex, with the whole purpose was to get out of the District 1 (the central district), see where locals live, shop & eat, a real quick city tour to get into the local life. We were first picked up by a driver and taken to the outer districts to where the locals have breakfast and we had the most incredible Pho there. We then went to a coffee house that was hidden beside a railway track. We would never have known about nor even seen this place if he didn’t show us. Again, in both places, it was only local people which were fantastic. 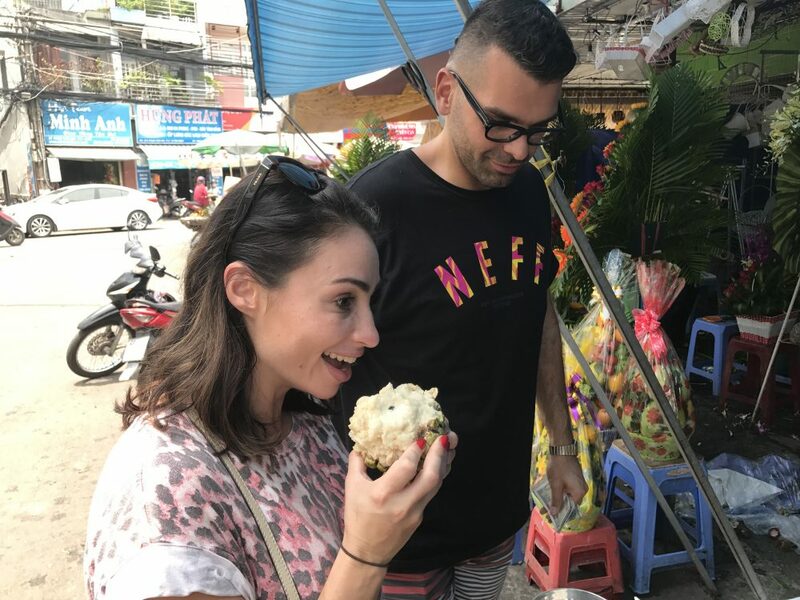 He wanted us to experience the area where he grew up, which was great to see, here we went to a local market and tried some native SE Asian fruits such as custard apples and mangosteens. After the market, Alex took us to a hidden restaurant at the top of an old apartment building, called The Secret Garden. It was an absolute oasis from the city full of delicious food. I wanted to look at some shops, so he showed us a crazy place full of shops inside a huge apartment building. It was so unique to see this kind of setup where there was a mix of shops, coffee houses and people living together in one building. This totally fulfilled our desire to see where the locals hang out, eat, shop and live. The trip with Alex gave us the feel of what a day in the life of a local would be like in terms of where to eat, and hang out. He shared with us the area where he grew up and that was really special. He took us out of the touristy districts, which would be difficult for us to do on our own. Next, we booked Yen for a nightlife experience, we wanted to go out to unique places where other tourists wouldn’t be at. She took us to this fantastic place for dinner called Propaganda which was traditional Vietnamese restaurant with a modern twist. The food was amazing and the vibe was bustling. We then decided to go out for a drink and to hear some music. She asked what style of music we like and said that there was a great live music scene in Saigon, so she took us to a place called Carmen Bar. It’s an underground music space with a South-American, Latin style. It was a very local hangout, which was awesome. What I loved about being on this tour with Yen was she didn’t take us to the typical hotspots where every tourist would go to, she gave a taste of the live music scene and we were the only tourists there which was great! Jack was booked for our tour to the historic Cu Chi Tunnels. Jack is an incredible history buff, any question we had, he delivered with an extensive answer. He really has a passion for sharing all his knowledge with you. We first stopped off at an art gallery workshop/centre where victims of Agent Orange produce unique and beautiful works of art. We went at a time when we were the only tourists there as Jack knows how to beat the crowds. We then went to the tunnels and his tour was fantastic. We hate those big groups of tours and this was the best way to see the area. He had so much to tell us about the area, it was fascinating. With Jack, his extensive knowledge and passion for history were the most impressive thing. He had so much to share, which allowed us to really immerse ourselves in the experience. We loved that in our time, we were able to experience all aspects of a city with the various Inspitrip guides in Saigon. One for a city local experience, one for nightlife and one for history. This gave us such a unique insight into what Saigon really has to offer and it was just the surface I’m sure. We wouldn’t have known about more than half the things we did or saw without our guides. Most of all it wasn’t standardised like group tours, it was unique and personal. That their number one thing was to make us happy and make sure we got the experience we requested. They all really put 110% into showing us the best possible time they could. We were able to see them as friends that we could connect with by the end of our experiences. We loved every guide we had, as they all had such unique personalities. We have even stayed in touch with Alex afterwards! Each one had a fantastic first impression and it only got better. It definitely added a whole other dimension to our time in Saigon. Overall, we loved it, and we can’t wait to come back! We also would definitely book more Inspitrip guides for other destinations in Vietnam as there is still so much to see and do. Our guides made our holiday even more fantastic and special than it already was.